Recognized as an exquisite brand in the domain, we are engaged in offering patrons a flawless array of Paper Bag Making Machine With 4 Colour Printing Machine Paper Bag Making Machine. With its international standards and as it ensures resistance against abrasion, it is highly sought after in the market. Offered machines are widely used for making flat and satchel paper bags from Kraft paper, greaseproof, white paper and poster. Implementing our rich domain expertise, we bring forth an illustrative Medicine Paper Cover Making Machine, which is designed to manufacture flat and satchel paper bags from , grease-proof kraft paper, white paper and poster.These bags are further used for packing confectionery, food stuff, ready-made garments, , tea powder, groceries and dry cleaner. Manufactured using latest technology, these machines are made available at very viable rates. With an urge to come up with an overwhelming machinery, We are engaged in offering our clientele, a wide array of Delhi Paper Carry Bag Making Machine, which is designed to manufacture flat and satchel paper bags from , grease-proof kraft paper, white paper and poster.With the aid of this Paper Bag Making Machinery, you can manufacture bags in different sizes for packing confectionery, food stuff, ready-made garments, _tobacco, tea powder, groceries and dry cleaners with ease. With the help of our distinguished professionals, we are able to put forth a precision-engineered range of India Paper Bag Making Machine. Under this assembly, we offer Paper Bag Making Machine, Bag Making Machine, Food Bag Making Machine and Paper Bag Machine. Offered paper bag making machines have longer service life, precise designs and resistance against corrosion as these are made using high grade steel and modern machinery. The entire manufacturing process is being carried out under the watch of quality controllers, who ensure these paper bag making machines are made in-tune with the specifications detailed by patrons. 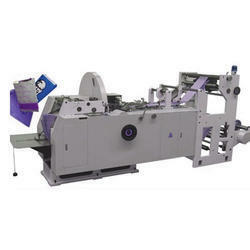 The area of expertise of our organization lies in the production of Paper Shopping Carry Bag Making Machine. Offered in diverse grades and dimensions, this Paper Bag Making Machine has been constructed and developed from optimum quality steel and is offered in diverse assortment. Equipped with 4 folding pockets, 4 parallel fold machines and three deflectors, this Paper Bag Making Machine is broadly used in the parallel folding applications. We are offering this Paper Bag Making Machine at reasonable price. Looking for Automatic Paper Carry Bag Making Machine ?